I feel this distribution must be known to the experts and not difficult to explicitly detail, but after looking at hitting times, first-passage times, self-avoidance times, and various other frequently studied random walk quanities, I am not finding a close-enough analog to help. Thanks for any pointers you might provide! Addendum. 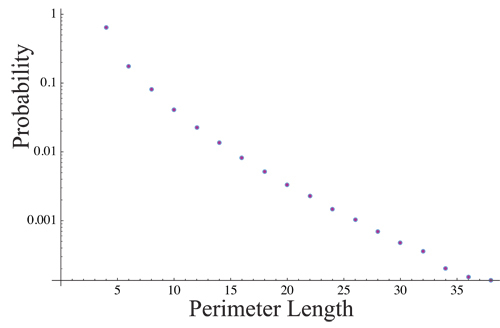 Here is log-plot of the probability of a perimeter of length $L$, based on a simulation of $10^6$ walks. The first point represents 642,225 perimeters for $L=4$, the second point 176,043 perimeters for $L=6$, etc. The last point plotted is 135 instances of $L=38$. 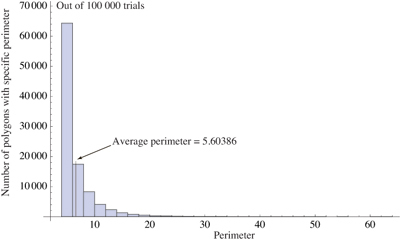 (There is one polygon of length $L=74$ in these million trials.) The average perimeter length is 5.62, which occurs after an average of 8.46 steps. Not the answer you're looking for? Browse other questions tagged reference-request pr.probability discrete-geometry random-walks or ask your own question. 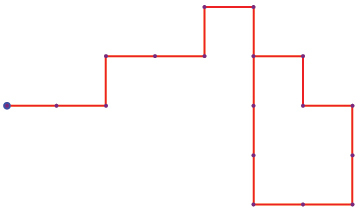 What is known about the distribution of lengths of the cycle you get by adding an edge to a uniform spanning tree? When do 3D random walks return to their origin? Will a random walk on [0, inf) tend to infinity?